World War I was the first major war where airplanes were used as a significant part of the military. The airplane was invented by the Wright Brothers in 1903, just 11 years before the start of World War I. When the war first began, aircraft played a small role in warfare, but, by the end of the war, the air force had become an important branch of the armed forces. The first use of airplanes in World War I was for reconnaissance. The airplanes would fly above the battlefield and determine the enemy's movements and position. One of the first major contributions of airplanes in the war was at the First Battle of the Marne where Allied reconnaissance planes spotted a gap in the German lines. The Allies attacked this gap and were able to split the German armies and drive them back. As the war progressed, both sides began to use aircraft to drop bombs on strategic enemy locations. The first planes used for bombings could only carry small bombs and were very vulnerable to attack from the ground. By the end of the war, faster long-range bombers were built that could carry a much larger weight of bombs. With more planes taking to the skies, enemy pilots began to fight each other in the air. At first, they tried throwing grenades at each other or shooting with rifles and pistols. This didn't work very well. Pilots soon found that the best way to shoot down an enemy plane was with a mounted machine gun. However, if the machine gun was mounted at the front of the plane, the propeller would get in the way of the bullets. An invention called an "interrupter" was invented by the Germans that allowed the machine gun to be synchronized with the propeller. Soon all fighter planes used this invention. With mounted machine guns, pilots often fought enemy pilots in the air. These fights in the air were called dogfights. The best of the pilots became famous and were nicknamed "aces." Each side used a number of different airplanes throughout the war. Constant improvements were made in the design of the planes as the war progressed. 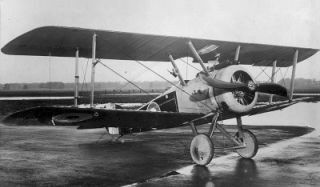 Bristol Type 22 - British two-seater fighter plane. Fokker Eindecker - Single-seat German fighter plane. The Fokker was perhaps the most famous fighter plane during WWI as it introduced the synchronized machine gun and provided Germany with air superiority for a period of time during the war. Siemens-Schuckert - Single-seat German fighter plane. Sopwith Camel - Single-seat British fighter plane. Handley Page 0/400 - Long range British bomber. Gotha G V - Long range German bomber. When the war first started, the planes were just regular planes without any military markings. Unfortunately, ground troops would try to shoot down any plane they saw and sometimes shot down their own plane. Eventually, countries began to mark their planes under the wing so that they could be identified from the ground. Here are some of the markings used during the war. Floating airships were also used during World War I for both reconnaissance and bombings. Germany, France, and Italy all used airships. The Germans made the most use of airships, using them extensively in bombing campaigns over Britain. Airships were often used in naval battles as well. The best fighter pilots in World War I were called "aces." Every time a fighter pilot shot down another plane, he claimed a "victory." Aces kept track of their victories and became heroes in their respective countries. Here are a few of the most decorated and famous fighter pilots. Manfred von Richthofen: German, 80 victories. Also known as the Red Baron. Ernst Udet: German, 62 victories. Famous for using a parachute to survive getting shot down. Werner Voss: German, 48 victories. Edward Mannock: British, 73 victories. The most victories of any British ace. William A. Bishop: British, 72 victories. Rene Fonck: French, 75 victories. The most victories of any Allied ace. Georges Guynemer: French, 53 victories. Eddie Rickenbacker: American, 26 victories. The most victories of any American ace. The Fokker Eindecker airplane became known as the Fokker Scourge when it was first used against the Allies by the Germans. The Germans called their airships Zeppelin's after their builder Count Ferdinand von Zeppelin. The first aircraft carriers were constructed during World War I. The first time a carrier-based airplane attacked a land target was in July of 1918 near the end of the war. The planes used in WWI were much slower than the planes used today. Top speeds were usually just over 100 miles per hour. The Handley Page bomber topped out at about 97 miles per hour.